Brazilian President Dilma Rousseff, whom Hillary Clinton praised for “setting a global standard” on how to fight corruption, now has protestors calling for her impeachment thanks to her own alleged corruption. The New York Times reported that this month’s protests calling for Dilma Rousseff’s ouster, including a 500,000-person gathering in São Paulo, were the largest since the protests that toppled Brazil’s military dictatorship in the 1980s. Recent polling shows that 68 percent of Brazilians want the legislature to impeach Rousseff, who has made clear she will not step down and plans to fight the charges against her. 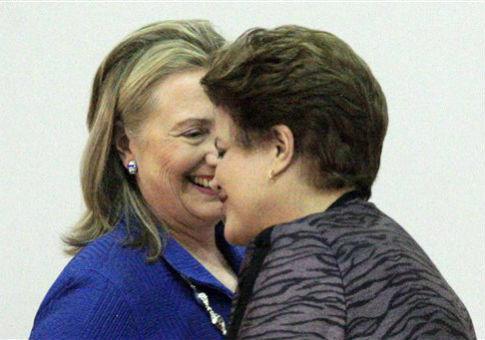 Clinton praised Rousseff in Brazil in 2012 at the first meeting of the Open Government Partnership, an international initiative co-chaired by Brazil and the United States aimed at fighting corruption. An audit court found that Rousseff borrowed up to $26 billion to pad government accounts in 2014, hiding economic problems that could have ended her reelection bid. Brazil’s Superior Election Court is also looking into charges that Rousseff brought in money for her 2010 and 2014 elections through an illegal scheme involving state-owned oil giant Petrobras. Rousseff chaired the company’s board of directors from 2003 to 2010. Rousseff claims that she knew nothing of the illegal Petrobras graft scheme, but other politicians implicated in the plan say that’s not the case. One senator, a political ally of Rousseff who was arrested last year for trying to bribe Petrobras executives to keep quiet about his involvement, recently said that Rousseff “knew about everything” and “benefited from the scheme” she inherited from her predecessor, Luiz Inacio Lula da Silva. The most recent protests concern Rousseff’s apparent attempt to protect Lula from the legal implications of the Petrobras scandal. Lula, the de facto leader of Rousseff’s Workers’ Party who chose her as his successor, had his house raided by police earlier this month and was brought in for questioning due to his involvement in the Petrobras scandal. Shortly after the raid, Rousseff named Lula her chief of staff, a cabinet position that would shield him from prosecution for corruption charges. The illicit motive behind the nomination was so apparent that a judge on Brazil’s highest court immediately blocked Lula’s appointment. The potential charges against Lula are substantial. Prosecutors believe that Lula was a central figure in the Petrobras scandal, in which the oil company was awarding inflated contracts to construction companies that would in turn funnel money to politicians. Prosecutors have already charged Lula for hiding his ownership of a beachfront penthouse apartment that was renovated by OAS, a construction company that saw three of its executives arrested last year for their role in the Petrobras bribery scheme. The construction company has given between $1 million and $5 million to the Clinton Foundation and has been a partner of former President Bill Clinton in the Haitian relief effort he leads. The Clinton Foundation has also made its presence known in Brazil. The 2013 Clinton Global Initiative conference was held in Rio de Janeiro, where Rousseff was featured as a speaker. The Clinton campaign did not respond to a request for comment on Rousseff’s corruption scandals.